So what’s a Dorothy Doc Indiegogo, anyway? Producer Tobi Elliott and the amazing Allana Thorne of Thorne Crate Co. (www.thornecrateco.ca) at the Gabriola Street Arts and Fair last Sunday, promoting the Dorothy documentary and Tee-shirts, AND the best lil’ gift crates you’ve ever seen! You may be new to the Dorothy team, or you’ve recently seen the project in the media, or you might have been with us since we started shooting the restoration process in December 2012 at Tony Grove‘s shop — or you are so excited about Dorothy you jumped on board and bought a T-shirt at the fair last weekend! Wherever you come from… WELCOME to the adventure, THANK YOU for joining the team, and KUDOS for being one of the rockstars helping create this documentary. I have to admit, I’m a little nervous right now… because on Sept 12 I am launching the biggest campaign of my life on Indiegogo.com, an online social fundraising platform. Indiegogo – which is like Kickstarter but more global and less U.S.-based – allows anyone around the world to support a project and boost it from idea to reality. 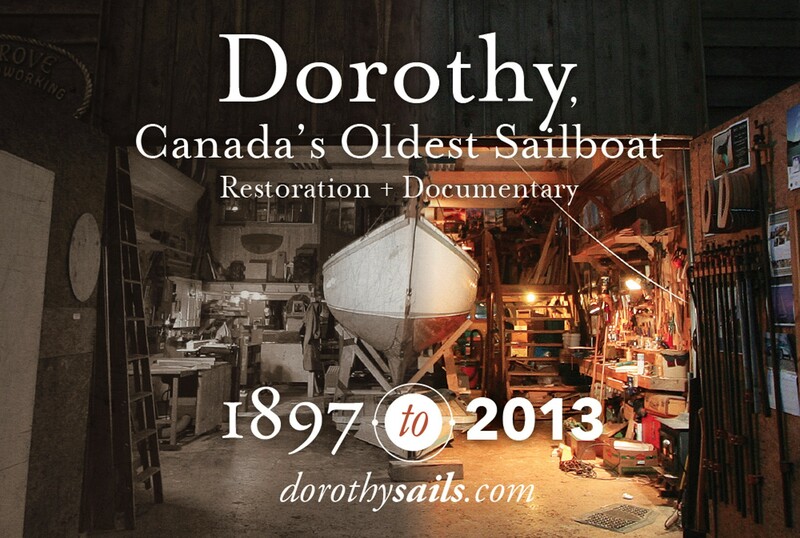 This campaign is to be able to fund some of the production costs for the documentary about the restoration of Dorothy, the oldest sailboat in Canada, happening right now on Gabriola. Although we are totally committed to and passionate about this documentary, the financial load is a lot to carry, so we’re opening up the project to ask for community support. So, what IS this campaign about, and where are we headed? 1. SEPT 12 VIRTUAL AND ACTUAL LAUNCH PARTY at a yet-to-be-disclosed location, featuring the film trailer and a new video clip of Tobi getting embarassingly real and honest with her fundraising pitch. And of course there will be dancing and good tunes curated by some amazing friends of mine. You can even come if you’re in Montreal or the Azores, just log in to Indiegogo and give us some love. 2. SPREAD THE WORD: Through our website and Facebook page, I let people know the campaign has begun, and where the ‘Dorothy Documentary’ site is. The more people who are aware of the campaign and are getting our newsletters, the better chance we have of getting off to a good start – so please encourage people to enter their email in the “FOLLOW DOROTHY” box on our front page! 3. DONATE: People around the world can log in and donate any amount they want toward the production, or donate anonymously. 4. GET AWESOME SWAG IN RETURN: Donors get a perk at the level they donate after the campaign is over, such as a Tony Grove print, a crate of handcrafted goodies from Gabriola Island, a lovely package of natural facial care products, a work of art (the list of donor artists is growing by the day! ), a Dorothy T-shirt, or a Hi-res download of Dorothy under sail from a period of your choice. Donors in the US can claim a charitable tax receipt because I’m working with a fiscal sponsor in the U.S., From the Heart Productions. 5. BE PROUD AND SING IT LOUD: You tell people that you just gave to the Dorothy documentary, and encourage them to do the same. 6. SUCCESS! We reach our goal of $20,000 to keep filming through this fall and winter without too much stress, and celebrate with YOU and a great party on October 30th! Yay! To know more about Indiegogo, I encourage you to browse the site and read some active campaigns. As the world’s largest democratic global fundraising platform, they help 1000s of innovative projects – from unbreakable sunglasses to better socks, from the newest smartphone technology to in-vitro fertilization for an struggling couple to have a baby – get off the ground. Final note: this campaign is not about money, it’s about community. It’s true – I don’t actually have all the resources to pay what it takes to make this the beautiful film Dorothy deserves. But it’s not financial need that’s driving this campaign. It’s the thrill of not doing it alone. As a filmmaker, I stumble around the world trying to understand things through the lens of a camera and audio recorder. Most of the time, when I come across a story I see a glimpse of something great, and then labour in quiet agony for years trying to capture the essence of that story for the world to see. (See “The Trapper of Peace River”) It’s a lonely and often heartbreaking process. And, I found out, it doesn’t really work. You can’t make a film in a vacuum. Filmmaking takes a community. And documentaries, because they pick up on on social and cultural threads that touch all of us, are even more so. And frankly it’s not fun to bang your head against the wall in some kind of gloomy misunderstood-artist funk, and do it alone. So I abandoned that idea, enlisted the help of some able friends, and wow, then things started to really get cooking! So many great things have happened since we began opening this up to the global community of Gabriolans and boat lovers and documentary fans that I know we are on the right track. People want to get involved, want to help, want to cross-promote and assist. People are basically lovely, giving, generous human beings. I love people. So thanks *all you wonderful people* for coming on this journey. It’s just so darned exciting to do things together.